Our last week in India has been somewhat of a blur. We went from having loads of time and lots to do, to having no time and still lots to do. At the top of the list was a bike service. Pro-Bikers in Chennai came recommended by Harshil, the bike guy we met in Gujarat a couple of months back, and they definitely lived up to his praise. With a couple of weeks’ notice Suresh, the owner, had ordered all the parts we needed to change on the bikes: chains, cassettes and tyres. Out of everything, the tyres were the trickiest item. We wanted a straight-up swap of our Schwalbe Marathon Mondial 26x2.0, but these proved impossible for Suresh to find in India and we didn’t have enough time to post some out from the UK. We ended up getting Schwalbe Marathon Greenguard 26x1.75. Everything we’ve read about cycling in Africa stressed the fatter the tyres the better. Sadly, we’ve dropped ¼ inch, but there is a silver lining. We have gone up one in the Schwalbe Puncture Protection rating (1-7) from 4 to 5, which will be handy on Africa’s thorn-infested roads. The bikes were a dream to ride when we picked them back up – like new. Although we only got to ride them 23 km before we boxed them up ready for our flight. 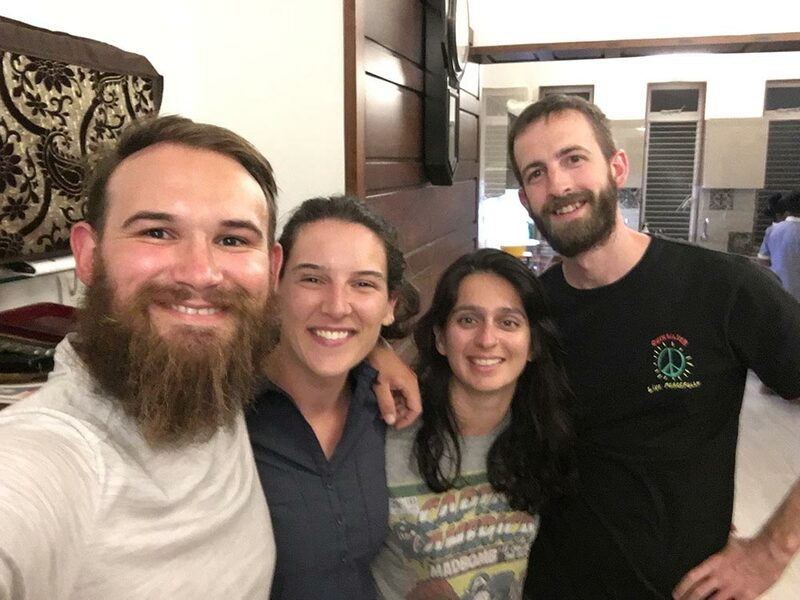 The rest of our time in Chennai was spent working our way down the must-do list: antimalarials, cull kit, US dollars, bike boxes, laundry (the first machine wash in 3.5 months), book bike spot on train, and so on. 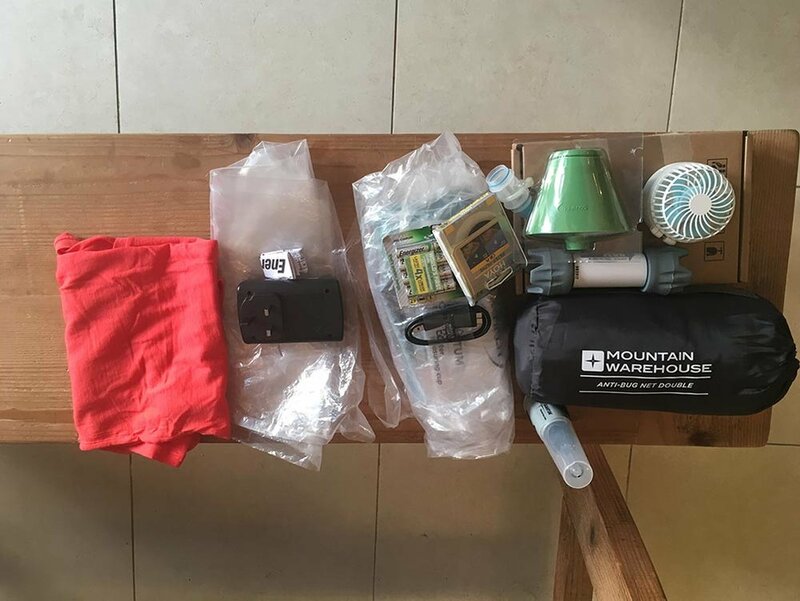 For those interested, I’ve gone into a bit more detail at the bottom of this post of exactly what we’ve had to do before travelling to East Africa. With nearly everything ticked off our list, we boarded our pre-booked 30 hour train to Mumbai. The process of getting the bike aboard this time was considerably easier than that very first train we took, mainly as we already had our tickets. We were simply told to arrive four hours before departure to fill out some paperwork and pay the nominal fee. We were even allowed to wait with the bikes and watch them being loaded into the cargo hold for peace-of-mind. The train journey was lovely. It was a welcomed break from the busy few days we’d had in Chennai. It was two sleeps and a full day before we arrived at 3.45am in India’s mega city: Mumbai. Mumbai is mental. Despite not being the capital of India, it’s actually India’s most populous city, with an astonishing 18.4 million people. It’s also India’s most wealthiest city, with the highest concentration of millionaires living there. Walking around it certainly felt like India’s busiest city. People moved as one big unit – there were rarely gaps to overtake people. With fewer things to do, we did get to enjoy Mumbai more than we did Chennai. ‘Enjoying’ mostly involved drinking beer. We got to meet Harsh, who’s a friend of Harshil’s, and helped us plot the amazing cycle down the west coast of India. We were also invited for dinner at Aranka and Logan’s. They’re a cycle touring couple who we were put in touch with through another cycle tourer. Aranka was super helpful with our Malarone mission. It was the perfect last meal – a home-cooked feast. We also got to try Old Monk, their favourite rum of choice. Having it with lychee juice was different, but surprisingly good. In Mumbai we also visited Effingut Brewery. We haven’t had a good beer in so long. 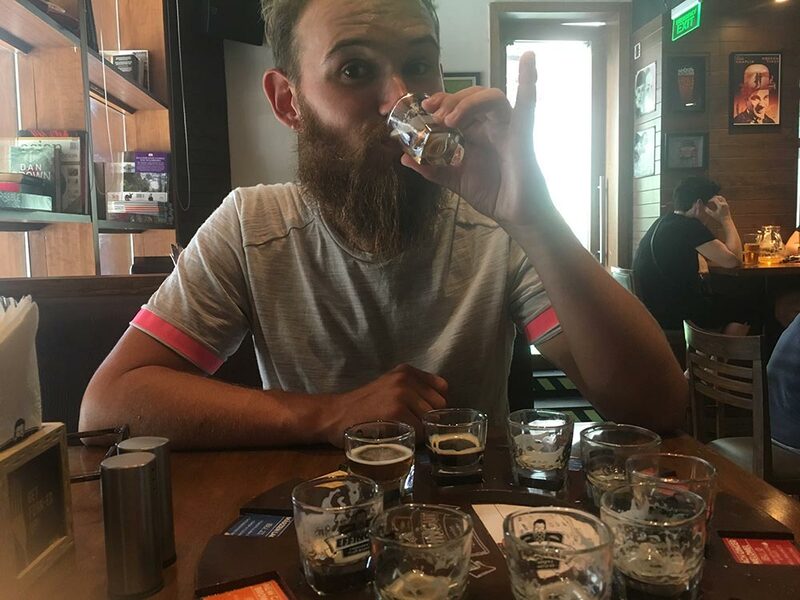 They give you a complimentary tasting tray before you order. A pint certainly rivalled London prices. And then just like that our three months in India was over. In comparison to our three months in Nepal, the time here has flown by. We feel like we’ve seen a vast array of what this incredible country has to offer, from dry arid lion territories, to tourist beaches, to mountains and more. But it hasn’t been easy. Quite the opposite. India really does throw extreme highs and lows at you. You can be enjoying a chai with a lovely bunch of locals at lunchtime and practically crying by 7pm because you can’t find accommodation. If you’ve been following our Indian journey from the start, you’ll have seen some of the challenges we’ve encountered. India can be a difficult country to travel, never mind cycle. Dan and I have been locked into a debate these last few days as to whether we’d recommend cycle touring here. Of course we have completely conflicting opinions, but you’ll be surprised to learn which is whose. Dan, who regards India as one of his favourite countries, believes the drivers and dogs ruin cycling in India. If you’re not fighting one, you’re fight the other and after three months they’ve worn him down to the view that he’d never cycle here again, with maybe the Indian Himalayas as an exception. I, on the other hand, who wasn’t particularly looking forward to visiting India, as I don’t like crowds or fuss or loud noises, would totally recommend cycling here. India has far exceeded my expectations in every way and if you put a bit of effort into route planning, you’ll find yourself on quiet or single-track roads. Unavoidable sections of highways can be bypassed with a local train. I don’t suppose that really gives you an answer. If we conclude the debate, I’ll let you know. All boxed and bagged, we caught an Uber XL to Chhatrapati Shivaji International Airport – Uber XLs were invaluable in transporting the packed bike boxes around Chennai and Mumbai. It’s usually at check-in when cycle tourers start to sweat, wondering if they’ll be left off that tipple over their bag allowance. But since we were flying Emirates, we just confidently breezed up knowing we were well under our 40 kg each. Our stuff came to 38 kg each. We don’t usually fly with such a fancy airline, as they’re always beyond our budget, but when we came to book the flights a few months back, Emirates came out cheaper when we considered the bike charges of the cheaper airlines. Emirates take bikes as part of your checked baggage, rather than them incurring an extra fee. Now the next leg of the trip begins. Before landing in Kenya, however, we swindled a long layover in Dubai and got to spend an evening at Tom and Jodie’s, who live out there. This made it the third time we’ve seen Tom since leaving last April – at his and Jodie’s wedding and in Nepal. There’s a small chance we’ll make it a fourth, as he may come out to Zanzibar when Dan’s family come out to meet us for a couple of weeks at the end of May. 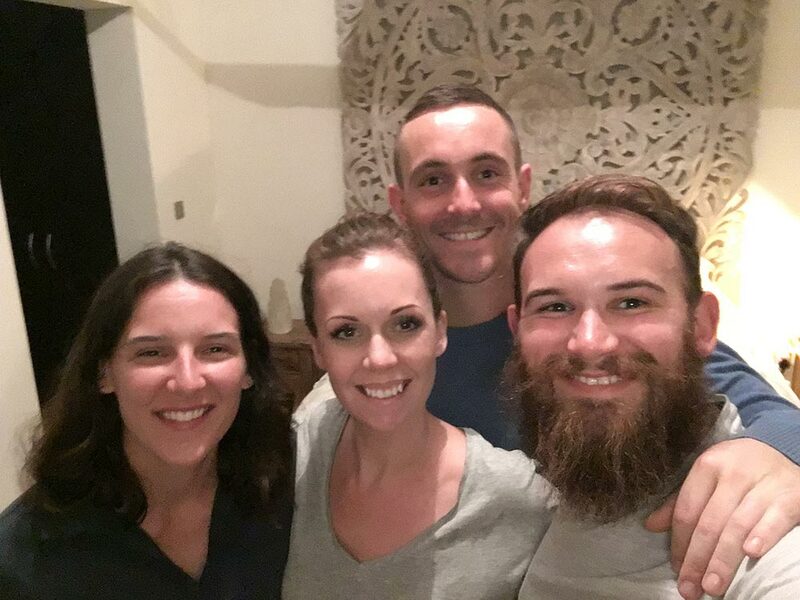 Not that we’re wishing away our time in East Africa, but we are so excited to see everyone on Zanzibar Island! Tom and Jodie spoiled us rotten while we were there, plying us with Guinness at Irish Village – their usual watering hole – before a whistle-stop tour of the Burj Khalifa, the world’s tallest building at 828 m; and the spectacular water fountain show. Then we kicked back at theirs with a Lebanese takeout and cuddles off their bulldog, Piper. Tomorrow we fly to Nairobi. We are super excited, but as you’d expected, we’re also quite nervous. Neither of us has ever been anywhere in Africa and while we’ve done a considerable amount of research and preparation, it’s still very much an unknown place to us. We’ll be well and truly out of our comfort zone, but they say that’s where the best experiences of your life are found. Wish us luck! Usual safety checks – We have done so much reading on the safety of East Africa. It’s vital to have up-to-date information, as situations around Africa have changed considerably over the last thirty years and change rapidly now. Gov.UK’s Foreign Travel Advice was our first port of call and we signed up for email alerts. We also referred to Pro Health Clinic, which was recommended by our NHS Travel Nurse. As well as that, we’ve read up on typical scams, slums, and areas to avoid, and best practises for wild camping with wildlife in mind. SteriPen Quantum Rapid Purification System – Our Gravity Work filter only removes bacteria. We needed something that also removes viruses, as water sources can sometimes carry waterborne diseases. This was the only SteriPen model we could order within the timeframe we had. It cleans 4 L in 150 seconds. Rechargeable batteries – A downside to the SteriPen we bought is that is takes AA batteries (the USB charging model wasn’t available). Since alkaline batteries are terrible, we bought some rechargeable ones. We also bought some AAA ones for our tracker, as that too demolishes alkaline batteries and lithium ones are hard to find outside of Europe. This was sent from the UK. Replacement Gravity Works filter – One filter has a 1,500 L lifespan. After some quick maths, we realised we’d be cutting it fine with our three months in India and four months in East Africa, since we’re filtering all water (plus cooking water). This was sent from the UK. Bike tweaks – As mentioned above, we fitted new components on the bikes. The chains, tyres and cassettes had done 9,400 km, including pre-trip kms. We probably could have squeezed a bit more out of them, but parts will be a lot harder to come by in Africa so now was the perfect opportunity. Antimalarials – This was a mission. We wanted Malarone, as it has the least side effects, but could not find it anywhere. We’ve bought doxycycline; a possible side effect is sun sensitivity and annoyingly you have to take it for four weeks after leaving the risk area. We had to buy 310 tablets – we’ll be rattling! – which in India came to £3.50. Impregnable double mosquito net – Again this was sent from the UK. We could have bought one in Kenya, but it wouldn’t have been as compact and this one is treated, so will kill mosquitoes on contact. Yellow Fever – You might remember we got this jab in Goa. The certificate is needed to obtain a visa for each of the countries we’re visiting – Kenya, Uganda, Rwanda, Tanzania – if you’re coming from a risk area. And they’re all a risk area. US dollars – You can only pay for visas with US dollars in cash. We learned from our Nepal visa mistake and made sure it was at the top of our to-do list. It’s also handy to have some extra US dollars, as they’re widely accepted around East Africa and can be changed into local currency if ATMs don’t work. Blue clothing – A random one. Tsetse flies are attracted to dark clothes, especially blue. These pesky buggers give a hell of a bite and also carry diseases, such as Sleeping Sickness, so we ditched as much dark clothing as we could. We had some new clothes sent from the UK. India Post – We tried to post another 4 kg to New Zealand – as we want the bikes to be as light as possible for off-roading – but this time India Post quoted us £9 per kg rather than £5 like we previously paid. So rather than send it, we brutally culled what was in the box and shoved the rest in our bags until the next big shipping. This was made possible by the fact that Emirates gave us a bag allowance of 40 kg each. In Kenya – When we land in Nairobi, we’ll buy a malaria test kit and course of treatment from a pharmacy (hopefully we’ll never need to use this). And we’ll also buy some Doom mosquito spray to use in our tent and hotel rooms. Older PostWeek Forty-Two: Did Someone Say Cheese?